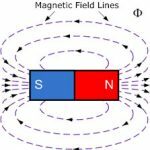 A current carrying conductor or coil produces a magnetic flux or field. Thus electricity is always associated with magnetism. This is known as electromagnetism. The magnetic effect of electric current can be studied for the following three cases. The magnetic field of a long straight conductor. The magnetic field of a solenoid. The magnetic field of a toroid. A long straight conductor carrying a current of I amperes produces a circular magnetic flux of ∅ Webers around it. 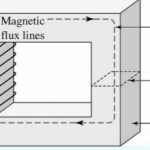 The magnetic field of a single conductor is very small. 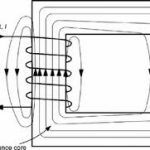 If a coil of N turn of the conductors is wound on a bar of a magnetic material like iron., the constructions are called solenoid. it has large length and relatively small diameter. The bar inside the coil is called the core. 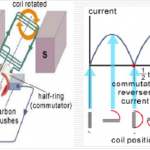 The solenoid can produce a large magnetic field inside its core. When a current I is passed through then turns of the solenoid, each turn carries a current I and produces a small flux inside the core. The direction of the flux is given by the right-hand grip rule. 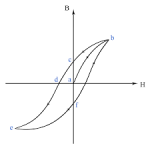 it is observed that all the turns produce the flux is given by the right-hand grip rule. It is observed that all the turns produce the flux in the same directions in the core, the total flux enters the core at one end which becomes the south (S) pole and flux leaves the flux leaves the core. The total flux enters the core at one end which becomes the south(s pole and flux leave the core from the other end which becomes the North (N) pole. Thus the solenoid behaves as a bar-electromagnet. the flux completes its circuit through the air. A toroidal core is formed by winding a long, thin rectangular strip of magnetic material. This laminated circular ring provides minimum reluctance to the flux. A magnetizing coil is uniformly wound over the complete length, of the current I. Thus the toroidal is a closed solenoid, So it requires current smaller than that of a solenoid for the same flux. The directions of the toroidal core flux are given by corkscrew rule or right-hand grip rule as applied to the solenoid.